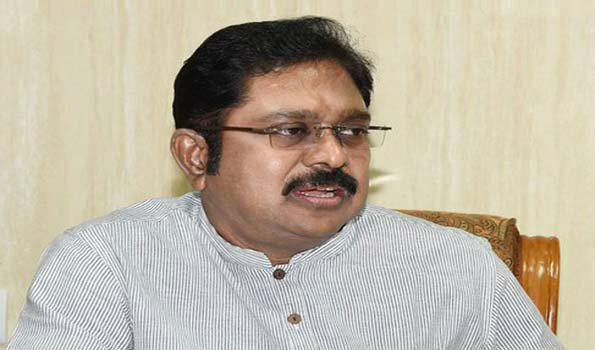 Madurai: Rebel AIADMK leader and Independent MLA from RK Nagar, T.T.V.Dhinakaran on Thursday floated a new political party and unveiled its flag at Melur, here.“Amma Makkal Munnetra Kazhagam (AMMK) will be the name of my party,” said Mr.Dhinakaran at a public meeting.He also unveiled the party flag with black, white and red colour stripes bearing the image of late Chief Minister J.Jayalalitha at the centre. Even though “Chinnamma” (Dhinakaran’s aunt V.K.Sasikala) is not here, I am introducing the party’s name with her permission and blessings, he said.“I am starting this political journey to overcome the hindrance put up by enemies and to bring back Amma’s legacy in Tamil Nadu. We will win all upcoming elections, whether it is cooperative, local bodies, assembly or parliament from now by using the latest party name (AMMK) and party flag. We will also reclaim the AIADMK party and its two leaves symbol from the betrayers Edappadi K.Palaniswamy and O.Panneerselvam (EPS and OPS),” he said.Mr.Dhinakaran vowed to oust the AIADMK regime and capture power in the state, till then will use cooker symbol. The party will work for the poor and downtrodden, generate employment opportunities, welfare of the farmers and to protect rights of the state in Cauvery issue and to make Tamil Nadu a best state in the country, a dream by Amma, he added.Thousands of supporters of TTV have turned up for the party’s launch, while all the 18 disqualified MLAs and three MLAs supporting Mr.Dhinakaran were present in the meeting.